Due to planning restrictions this house was permitted no windows to the front or side walls. Hence the main space relies entirely on the opening roof for its light, ambiance, and ventilation. Its size is not huge and equates to roughly 25% of the area of the room beneath, however the impact significantly transforms the entire house. Many would say such a roof is the key to unlocking an otherwise impossible site for development. With a ceiling height of approximately 3m this roof has three panes and a super low profile pitch. The roof slides away completely or can be left in a vent position, opening the seals without allowing rainwater ingress. Although ten years old the roof still looks as new. The use of stainless steel in the construction will ensure it continues to do so for many decades to come. Whether open in the day for sun or at night for stars, the breeze and the view says it all. We welcome customers to visit this house if they would like to experience an opening glass roof for themselves. It may seem an odd offer to show prospective clients a distinctly ‘middle-aged’ roof. Yet, what better way to state that we stand by the quality and durability of our work even after a decade of service, long after most other manufacturers would rather have no further association with their products? 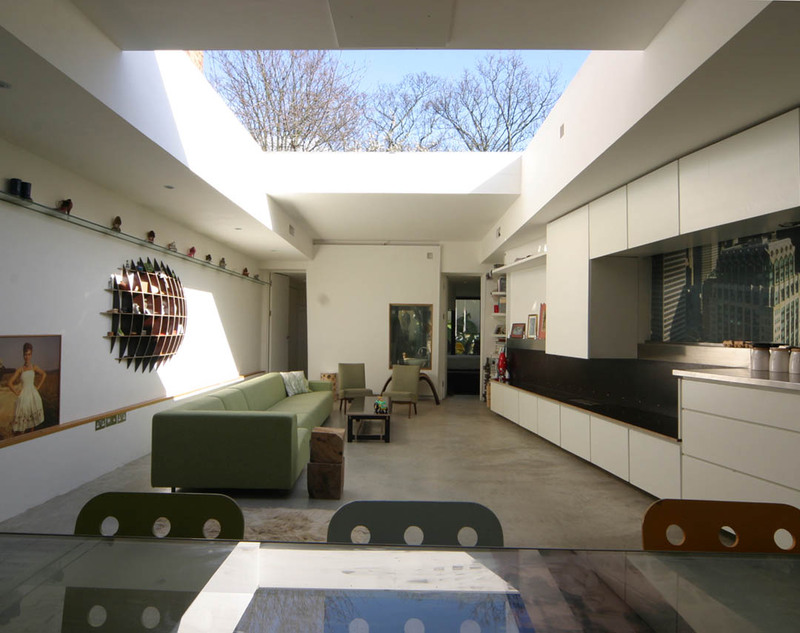 A flat sliding roof that completely transforms a windowless room. 3m by 3.1m. Featured on Grand Designs.